" By day, deep inside the Enchanted Garden's densest forest, the vast Agni Tree melts quietly into the sprawling greenery. But as dusk descends, Sparkling Fireflies teem around its warming branches. For they know the secret thrill of the Agni Tree, and their delirious dance is a harbinger of the joyous night fireworks to come. The Agni Tree's roots plunge to the depths of the earth, where they are nourished by molten lava. Each night, the magma rushes from the ground and pulses through the branches, until the crowning blossoms explode in a shower of vibrant molten fire drops, gleaming in every colour of the spectrum. The darting fireflies, smitten with the energy of these molten bubbles of joy, infuse their wings with the thrill; never knowing which hue will appear each evening. By dawn, these swift, uncurling flames of primeval fire dry into an exquisite concentrate, used to infuse with bliss the Enchanted Garden's various festivities." 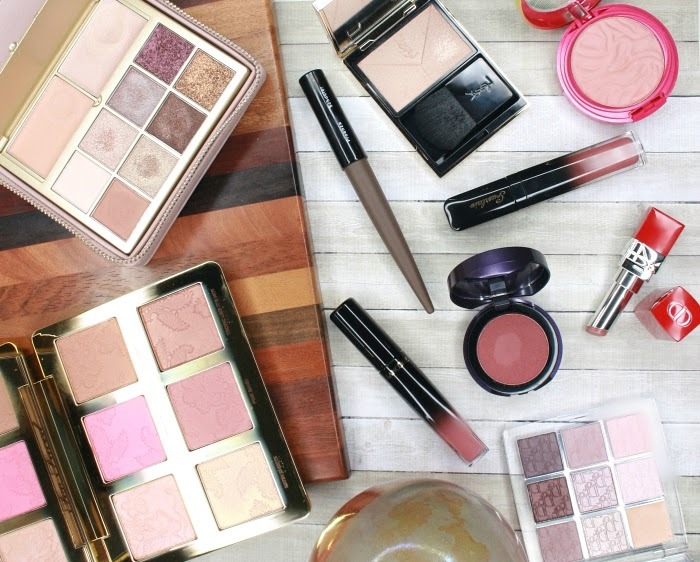 I do love when a brand embraces a different approach to beauty and sells me a little piece of dream together with each makeup item. I have to say, however, that I'm not ready to buy a ticket to Rouge Bunny Rouge's fantasy land. While I appreciate the effort and unique personality of the brand, the whole Enchanted Garden tale is not something I find very interesting. I must be too down to earth, but it's hard for me to read one of the product stories without stopping after a couple sentences. I can definitely see how someone who's into fantasy might be fascinated and tempted to collect the stories together with the products. If it's your case, then you'll likely adore the brand! What matters most to me is the quality of the makeup products, to be honest, so let's talk about the Fire Drops, also named Loose Glitter Pigment. The shade I own is Sleeping Under A Mandarin Tree, a peachy pale gold with a high level of shimmer. I really wouldn't call it Loose Glitter Pigment because there's nothing glittery to this shade. 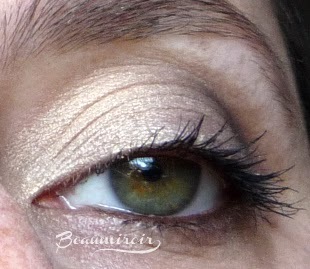 It's more of a soft, frosty shadow with a highly reflective finish, but it doesn't contain any large sparkles. Sleeping Under A Mandarin Tree has a little bit of a duochrome effect, flashing more peach depending on how it catches the light, with the base color being a light yellow gold. The pictures don't do much justice to its shimmery beauty. The packaging is very cute and in line with the brand's spirit, with a vegetal print on the transparent tube. It is, however, not very functional and likely to cause disasters. First, the black cap does not screw on and is just loosely sitting on top of the tube. 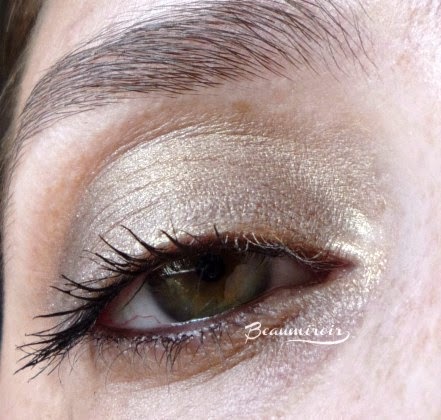 It falls off very easily and makes it impossible to carry the Fire Drops around, unless you want to turn your makeup bag into the Enchanted Garden, filled with loose shimmer. The applicator is at the end of a long, transparent plastic stick that ends in a flat spoon shape. This stick, again, is not secured, you just push it down and hope it stays there. 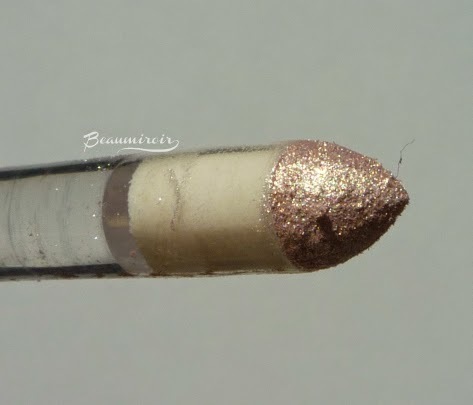 After a few uses, the length of the wand gets covered in shimmery powder, making this product a huge mess as the pigment flies away when you pull it out of the tube. The applicator itself, a cone-shaped foam sponge with a pointy tip, works surprisingly well to apply the shadow very precisely. 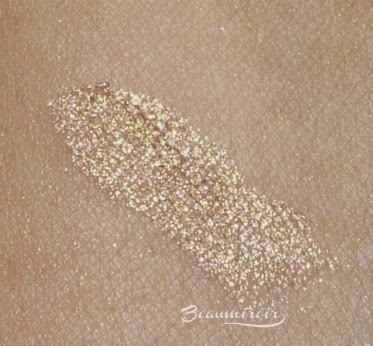 For a loose pigment, the Fire Drops adheres very well to the skin if used over a base, and causes only a minor amount of fallout (mostly due to the excess powder on the stick). It blends really easily, whether you use fingertips or a brush, for a sheerer wash of shimmer. 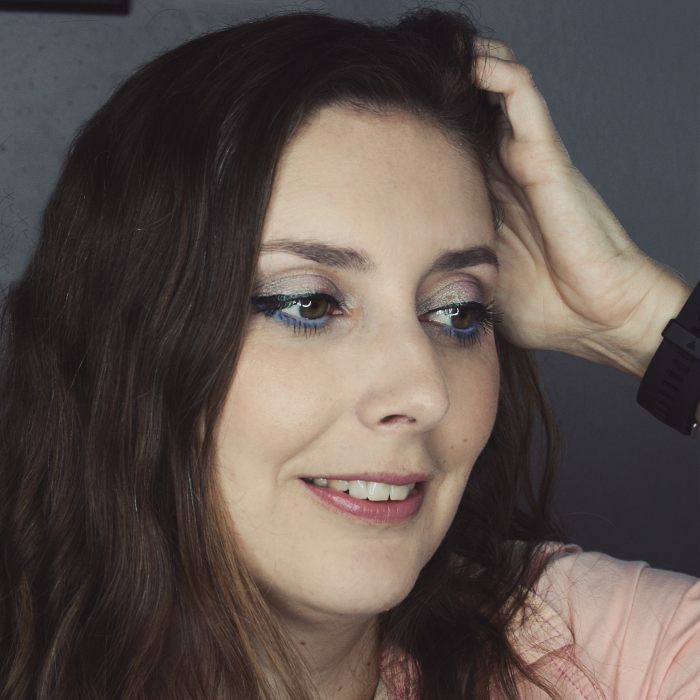 You can also apply it heavily by swiping the foam applicator on the lid and avoiding to blend, for a super shiny effect and higher color impact - I've done that in the inner corner for brighter eyes. It wears well too, without creasing or fading all day on me (remember, using a base under loose pigment is a necessity). 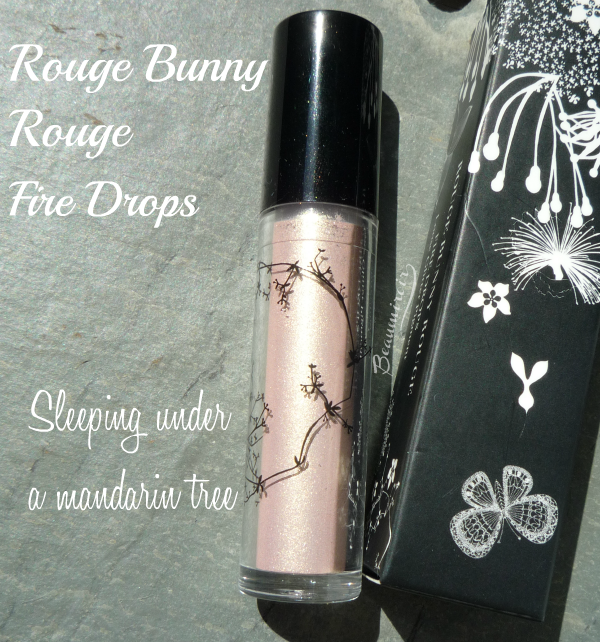 Overall: Sleeping Under A Mandarin Tree is a beautiful loose shimmery shadow with a light catching, shiny finish. Unfortunately, the packaging is not designed well and prevents safe transport. At $23, it is fairly priced, and I don't think I can possibly finish the tube in this life. Where to buy? 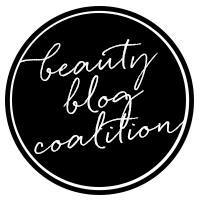 Online at b-glowing, beautyhabit, or Rouge Bunny Rouge's website. Hey Lulle, I have Embrace of Cashmere and I love it, too! I've never had any issue with the packaging tho. I prefer to pick the product up with a brush and apply that way. Maybe that's why? I did try to use the applicator in the beginning and it worked well, but a brush is faster so I stuck to that instead. This shade is interesting! I kept thinking it'd look really pink, but on you it doesn't seem that way! In the tube it looks like this shade might have some pink tones but I don't see any on my skin. It gets really warm and pale yellow to peach on my skintone. i've never heard of this but it looks really pretty, thanks for sharing! Rouge Bunny Rouge is still a niche brand, but now that they have an online store for the USA I'm sure they'll become more mainstream.